Researchers in this cluster address calls in Education and elsewhere for communities’ knowledge, practices and voices to be recognized and included in pedagogy and related research – a long identified gap. Our community-based collaborative work contributes a counterargument to top-down positivist approaches that operate from a deficit model often grounded in elitism, streaming, and tokenism and instead recognizes the need to draw from communities’ funds of knowledge to build participatory, collaborative, culturally responsive practices in formal and informal settings. 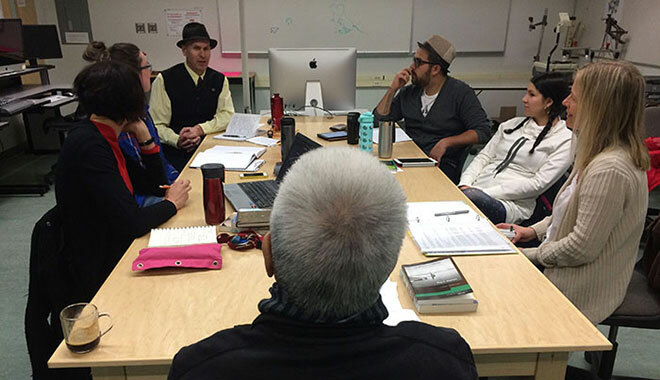 University and community-based researchers in this research hub are well suited to take up such pedagogy and related research working from epistemological orientations to living and learning that are community honouring. Our collective work addresses critical gaps in our fields and is theoretically-informed and research-based. We aim to bridge research, practice and constituent groups. The pedagogy and participation research hub draws on features of approaches that have proven highly successful elsewhere (e.g., Pedagogy of the Oppressed, Culturally Responsive Teaching, Critical Pedagogy, First Peoples Principles of Learning, Practitioner Inquiry, Universal Design for Learning, etc.). Distinguished Scholar Dr. Roy Miki talks to graduate students in Creative Studies.